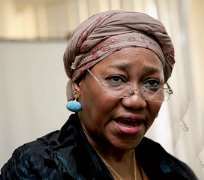 Former Chairman of the Economic and Financial Crimes Commission, EFCC, Dr (Mrs) Farida Waziri,OFR has reminded former President Olusegun Obasanjo that ability to be used to witch hunt political enemies in the rabid pursuit of a third term agenda has never been part of the qualifications for appointment as chairman of the anti-graft agency. Waziri stated this while reacting to publications on allegations made against her by the former president. Obasanjo had been quoted as saying that Waziri was not qualified to head the EFCC when she was appointed chairman of the Commission. According to the statement personally signed by Waziri 'My attention has been drawn to a number of allegations made against me by Mr Obasanjo. One of such was the alleged involvement of former Delta state governor, James Ibori in my appointment. While I hold the office of a Head of state, either serving or retired in the highest esteem, I will like to put on record for the umpteenth time that this is totally unfounded, blantant lie and arrant falsehood. It is therefore worrisome when a man who has been twice a Nigerian head of state can descend so low to peddle falsehood. The truth is that I never met Ibori in my life until after months in office as chairman of the EFCC when I used to see him in the presidential villa. It is on record today that I initiated the investigation that drove Ibori into the waiting hands of Interpol and Metpolice. As such, it is illogical and nonsensical for anyone to continue to insinuate that Ibori has a hand in my appointment. I remember this was one of the lies Obasanjo's sit-tight pawns cooked to stop my appointment as EFCC chairman in 2008. 'On the issue of qualifications raised by Obasanjo, the qualification for appointment as chairman of the Commission as stipulated in its Establishment Act says that the chairman shall 'be a serving or retired member of any government security or law enforcement agency not below the rank of Assistant Commissioner of Police or equivalent; and possess not less than 15 years cognate experience'. Late President Yar'adua did not have to alter the Establishment Act when he was appointing me unlike what Obasanjo did. 'Again for the records, I served in the Nigeria Police force for 35 years and got to the pinnacle of my career before my appointment as EFCC chairman. If Obasanjo's real age has not blurred his memory, I will like to remind him that I was a Commissioner of Police, Admin Force CID, CP General Investigations, CP Anti-fraud, CP X squad, CP Police Special Fraud Unit where I secured the first conviction in a case of Advance Fee Fraud in Nigerian history. These are all prime investigative organs of the Nigeria Police where I related with other law enforcement agencies including the FBI across the world. I must place on record that at SFU, I did not only relate with FBI, Interpol and Metpolice among others , we carried out joint operations at different times on a number of cases. I have also led the Nigerian delegation to the Interpol headquarters in France. 'To further expose the height of mischief in the allegations, the past and present chairmen of the EFCC have both worked under me, yet someone can open his mouth to say I am not qualified to head the same agency. This is in addition to my educational qualifications such as a first degree in Law, a Master degree in Law and another Master degree in Strategic studies. I doubt if Obasanjo himself can boast of this level of educational qualifications. 'I will also like to remind Obasanjo that no chairman of the EFCC has till date beaten my records in terms of investigation of high profile cases, prosecution, conviction and recovery.